Cardiac MRI can answer many clinical questions about the heart and great vessels better than other imaging modalities, including echocardiography, nuclear SPECT, and cardiac CT. However, cardiac MRI is labor intensive. It can take radiologists 30 to 45 minutes to segment the images that allow them to assess blood flow and function in and around the heart chambers. "That's a lot of time," says Albert Hsiao, MD, PhD, an assistant professor of radiology and associate director of cardiovascular diseases for the Center for Translational Imaging and Precision Medicine at the University of California, San Diego School of Medicine. "Doing it manually, you probably couldn't do more than a dozen cases a day. No one wants to commit that amount of time to interpreting cardiac MRI, and so it's not used as often as perhaps it should be." But what if the process of segmenting the heart and generating measurements from the images could be automated? Enter Arterys' Cardio DL, a cloud-based solution that provides automated, editable ventricle segmentations based on cardiac MRI images. The product was given FDA clearance in January. One of the company cofounders, Fabien Beckers, PhD, says the cloud-based platform's analytics can do in 15 seconds a task that takes a radiologist at least 30 minutes. "It is complete as soon as the radiologist opens the case," he says. "It's extremely accurate, too, and requires very little, if any, modification by the physician." According to Beckers, Cardio DL's cloud-based analytic system provides real-time image processing with previously unattainable resolution quality. Melany Atkins, MD, a radiologist at Fairfax Radiological Consultants (FRC) in northern Virginia, first used the technology when her workplace became a beta test site in March 2016. In January 2017, FRC upgraded to the latest version of Cardio DL. The technology is installed on only one of the magnets at the outpatient centers, but Atkins requests that cardiac patients be scheduled on that magnet, GE Healthcare's new SIGNA Architect, whenever possible. Atkins uses Cardio DL in conjunction with GE Healthcare's ViosWorks, which provides 3D cardiac anatomy, function, and flow in one free-breathing, 10-minute scan. It's a fraction of the 30 to 60 minutes that conventional cardiac scans take. Such convenience makes the acquisition and cloud-based analytic system not only physician friendly but also patient friendly, Atkins says, adding that it's great for imaging children because they are not required to hold their breath. "The gated, free-breathing acquisition allows for decreased motion artifact and, because the acquisition is faster, it allows for decreased anesthesia time, which is very important. In addition, it affords whole-heart coverage in a single acquisition," Atkins says. Atkins believes ViosWorks and Cardio DL also offer advantages for technologists. "The sequence is very technologist friendly," she says, noting that conventional cardiac MRI scanning requires the technologist to have a great deal of training, something this set-up does not—the 3D acquisition eliminates operator dependence. Atkins is still learning to use Cardio DL to its fullest capabilities, adding that "it doesn't take the place of everything I do currently." While she uses the technology for all flow data and some functional data, her long-term goal is to do both flow and function. "It's still a learning process, and it still has some improvements to make," she says. Cardio DL is made possible with artificial intelligence (AI) techniques popularly known as deep learning (some call it by its original academic designation: neural networks). Beckers and Hsiao, who along with John Axerio-Cilies, PhD, and radiologist Shreyas Vasanawala, MD, PhD, cofounded Arterys, explain that AI differs from the way computers have been taught to perform human functions. In the past, software engineers established rules that allowed the computer to perform a task such as finding the right ventricle or a lung tumor. "They hard coded the rules in the software and entered them to find whatever they were looking for," Beckers says. Writing rules for the computer, however, has its limits. "You can only code so many of those rules," Beckers says. The engineers had to figure out rules that mimicked the way people perform the task, Hsiao says. AI is different in that it allows the computer to think for itself. "It's a different paradigm," Beckers notes. Neural networks aren't new; the concept dates back to the 1950s. What's made it a reality today is that "we have so much computer power available to us," Hsiao says. And computer scientists have figured out how to harness this vast power with the enormous storehouses of data—images, video, audio, and text files—strewn across the internet. The hardware has developed as well. In the early 2000s, the technology company Nvidia created graphics processing units (GPUs) to give video gamers rich, 3D visual experiences. The GPUs Nvidia developed were 20 to 50 times more efficient than the original central processing units for deep learning. "You can do lots of computations with graphic cards that were designed for video games," Hsiao says. "You can use them to do huge amounts of computation. Instead of teaching them specifics, you design networks of interaction, of thousands of nodes pieced together—called a neural network—and you basically create an electronic brain that can learn a particular behavior." Hsiao says what Arterys has done is use this technology to create a brain that can look at heart images the same way a human would and measure what a human would—including the size of the heart, the right ventricle, the left ventricle, and the endocardium—on its own. However, to complete these tasks at a workstation would require individual supercomputers at every site. The company founders realized it would be better to send the images to the cloud, where they would have access to thousands of GPUs, for processing. It takes at least one thousand data sets to train the network, Beckers says. The more data sets available, the faster and more accurate the network becomes. Arterys introduced Cardio DL once it had 1,000 images, but it now has at least 10 times more, Beckers says. Arterys' cloud-based imaging analytics platform is designed to acquire seven dimensions of data, including 3D heart anatomy, blood flow rate, and three measures of velocity direction of blood flow. Health care has been slow to take advantage of the cloud, compared with other industries, mostly because of security concerns, Beckers says. Knowing this may be an issue, Arterys developed a way for its users to send images to the cloud without identifiable information. Patients' personal data are stripped from the scanner files before they are uploaded to the cloud. Only raw image data go to the cloud, Beckers says. "The physician can still build a report and search for and see the patient's name," says Beckers, "but we as a company never have access to that information." No one who has used the technology has expressed concern because it's "clear that we're not keeping and not accessing any patient health information," he adds. Among the unconcerned is Atkins, who is confident that patient information is safe in the cloud. "Everything is safe," she says. "There is no risk because the information is made anonymous at the level of the scanner." The genesis of Arterys began in 2011 when the four cofounders were at Stanford University. "We wanted to bring medical imaging data together in one centralized place where we could improve the efficiency of the reader by making it interactive for physicians to analyze the images," Hsiao says. "We started with cardiac MRI because it is so labor intensive." Among the large medical imaging vendors, GE Healthcare was Arterys' first partner, but the platform is vendor neutral—it works with any standard images and DICOM data. In February 2017, at the Healthcare Information and Management Systems Society annual conference in Orlando, Florida, it was announced that Arterys will provide Siemens customers with its imaging solutions and services as part of Siemens Healthineers Digital Ecosystem. Initially, Siemens will offer the Arterys 4D Flow solution to research institutions with which it has agreements. Siemens says it anticipates providing wider commercial availability of Arterys 4D Flow later this year. Currently, cardiac MRI is the only Arterys model and application with FDA approval, but the company is preparing to add more to its stable. "We are working with physicians and asking them to tell us what would be most useful for them," Beckers says. One coming soon: AI to help diagnose cancer earlier and less invasively. "I see a role for AI in following cancers over time, especially after treatment and seeing whether a particular treatment is helping or not," Hsiao says. "These are the kinds of things AI can help us with so we can be more efficient as radiologists and our reports can be more consistent and reliable." Some professionals, including radiologists, are concerned that AI technology puts their jobs at risk. However, those familiar with the product would argue otherwise. The radiologist still has to interpret the data, Atkins says. "It's just helping to process the data, but not taking the role of the radiologist or cardiologist," she says. Because radiologists don't have to spend 30 minutes or more drawing contours, they can devote more time to interpreting the data and working with the ordering physician on devising a treatment plan, Beckers says. Ever since PACS allowed physicians to read studies from anywhere, the interaction between ordering physicians and radiologists has faded away, Hsiao adds. "If this technology means we are spending a lot less time on labor-intensive steps, we could be spending more time discussing with cardiologists and other physicians about what they should be doing for their patients based on the imaging they just got," he says. Because it's cloud based, the analytic platform also can help radiologists share best practices and learn from each other, Hsiao says. "You might have colleagues in Boston who are doing similar work as you, but they do their measurements slightly different from you and as a result see something on the images that you don't," he says, adding that the system can be trained to view images in the same manner as other radiologists are viewing them. 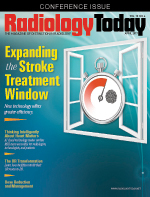 "It can aggregate the experience of multiple physicians from multiple places and develop the best platform that radiologists around the world can use to interpret images." Hsiao says such technological advances make these exciting times for health care. "I believe that aggregating data and making these kinds of algorithms on the cloud will transform health care—the same way that AI is already transforming other industries," he says.